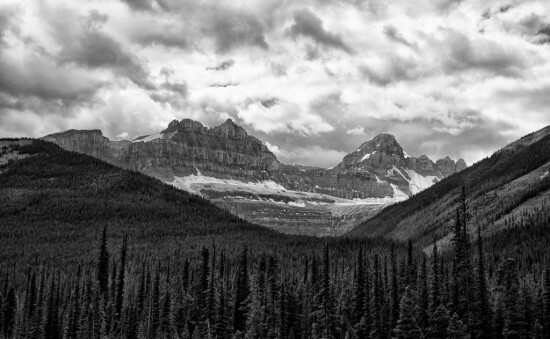 Soaring mountaintops with hidden valleys filled with the unimaginably large icefields. 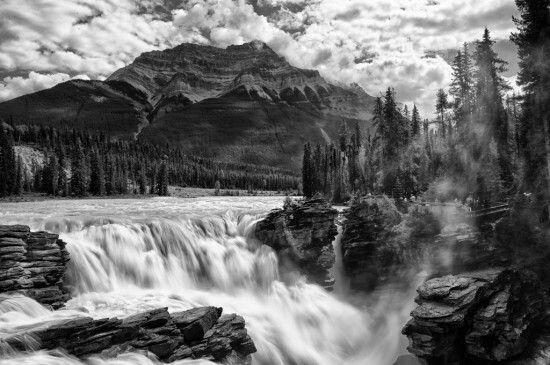 Wide valleys filled with glacier-ground rocks and turquoise rivers rushing towards the next waterfall. Pine trees as far as the eye can see. 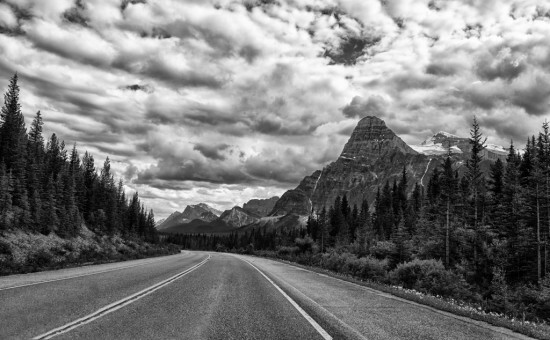 All of these things are synonymous with Alberta’s Highway 93, which I’ll go out on a limb and say is one of the most stunning trips in North America. Clouds tumbling over the mountains at Sunwapta Pass. Many people would argue that this description would fit California’s Yosemite National Park as well. 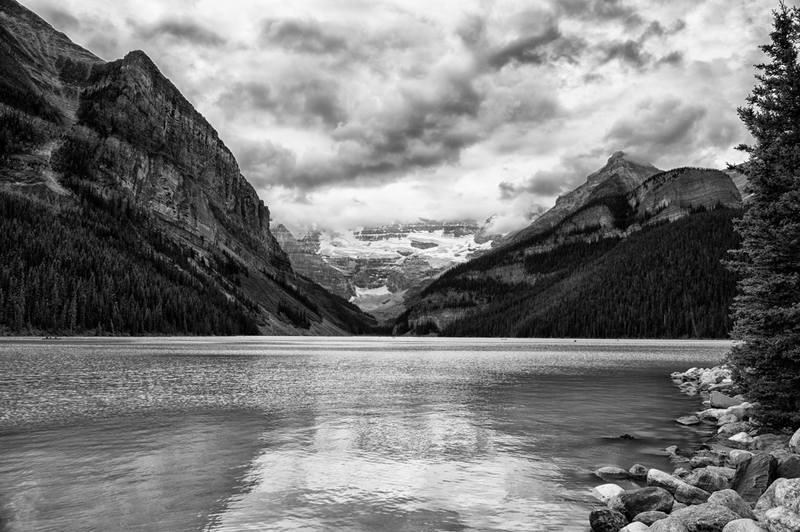 While I’ve never been to Yosemite–sadly–I feel like I know many of its iconic vistas through the photos of Ansel Adams. One of the original legends of photography, Adams drew his inspiration from the Yosemite wilderness and made it famous through his brilliant black & while photos. 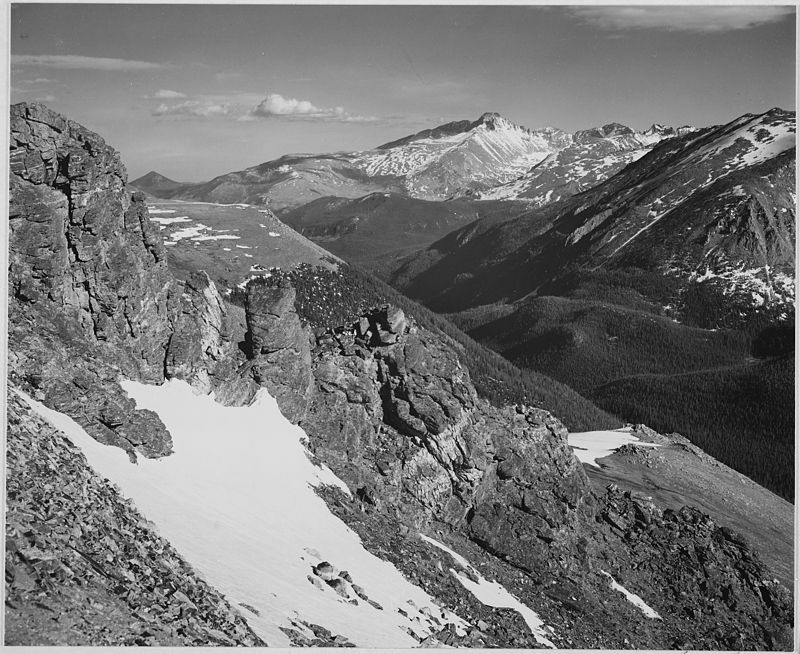 Rocky Mountain National Park by the legendary Ansel Adams. Photo in the public domain. 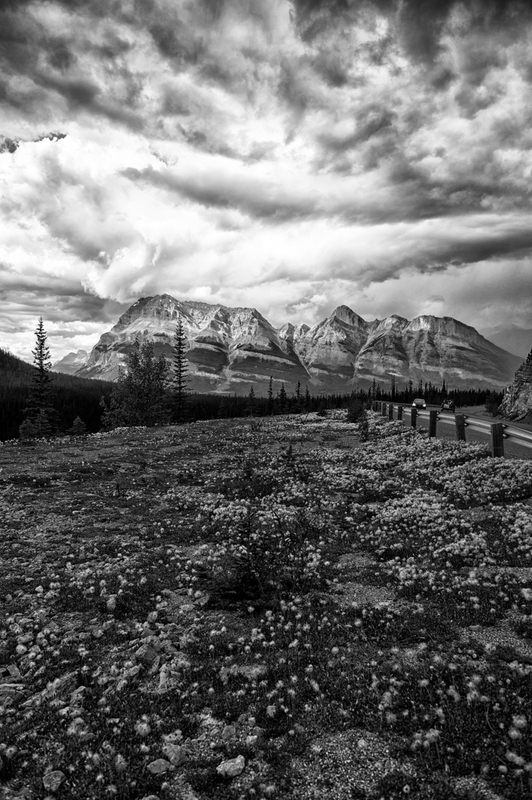 Standing deep in one of the valleys of the Icefields Parkway, I began to comprehend how Adams may have felt about his favourite National Park. Every tree, every far-off glacier, every impossibly tall mountain peak made me feel tiny compared to the nature around me. 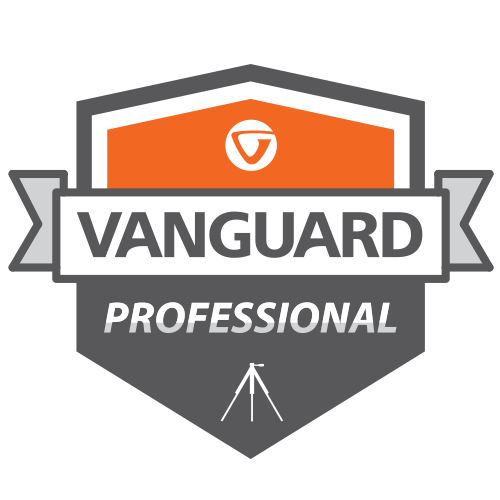 How could a job search or the impending end of my career break possibly worry me here? 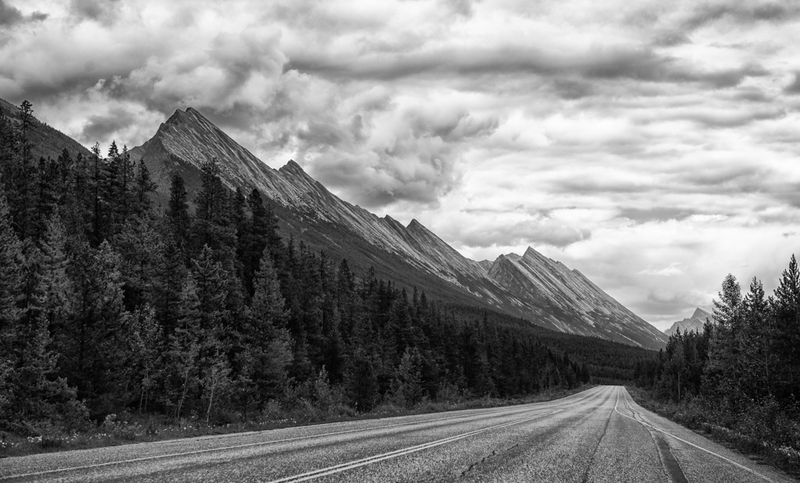 Even though I didn’t get to lace on my hiking boots as much as I would like, I felt a calmness descend on me as we drove along that was very similar to how I feel when I stand at a trailhead. 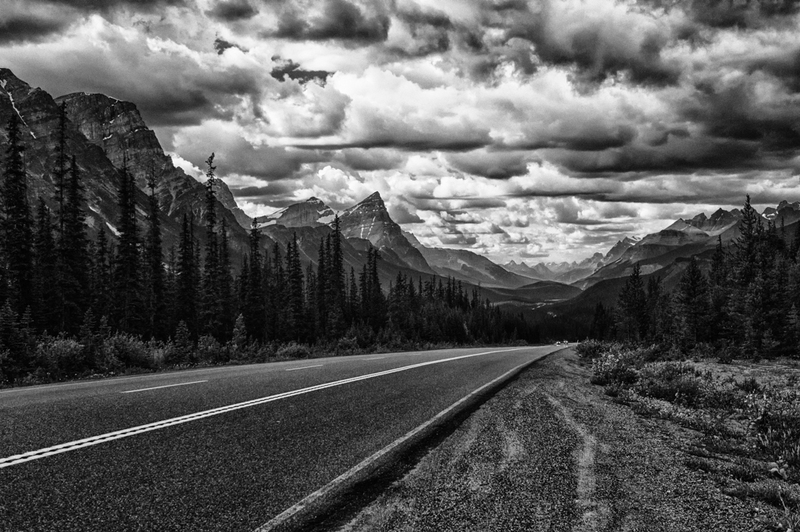 Therefore, I feel like it is only fitting to show you the Icefields Parkway in the way Ansel Adams would have seen it in his darkroom: in dramatic black and white. One of the “hobbit bridges” on the Trans-Canada Highway. 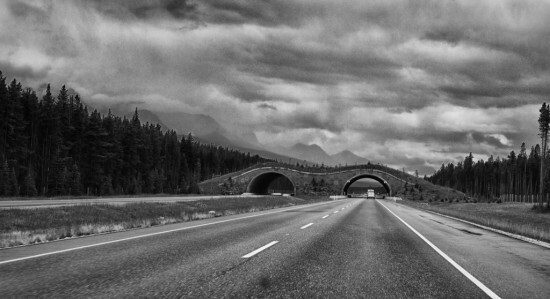 Just before you reach the Icefields Parkway on the Trans-Canada Highway, you’ll see a number of these bridges, which have been designed to keep wildlife from crossing the busy road. There’s been a big decrease in animal fatalities since these were built. And why “hobbit bridges”? Well, I felt like they looked just a little bit like a hobbit hole! 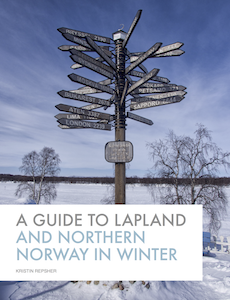 It’s no surprise millions of people come here yearly, either to skate on the frozen lake in winter or to canoe across it in summer. 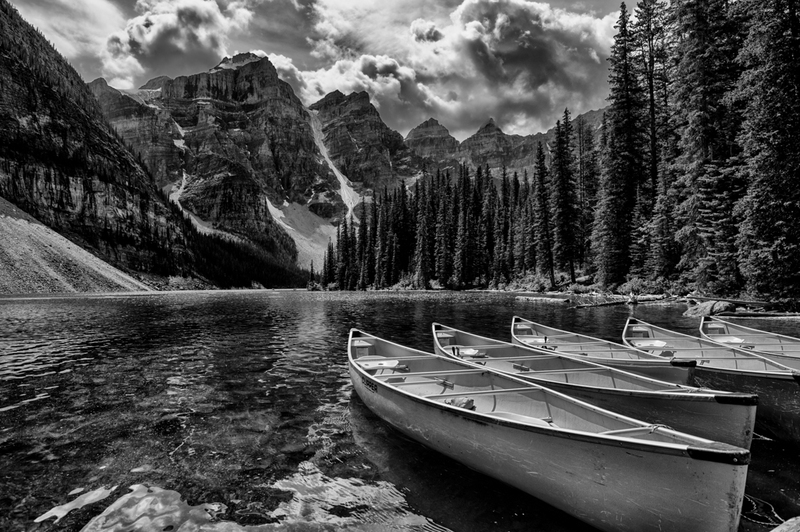 Moraine Lake — one of the most recognisable vistas in Canada. Not far from Lake Louise, about 15km down the Moraine Lake Rd, is Moraine Lake. This is one of the most recognisable vistas in Canada, and with good reason. It’s an absolutely stunning view with some of the bluest water you’ll ever see. 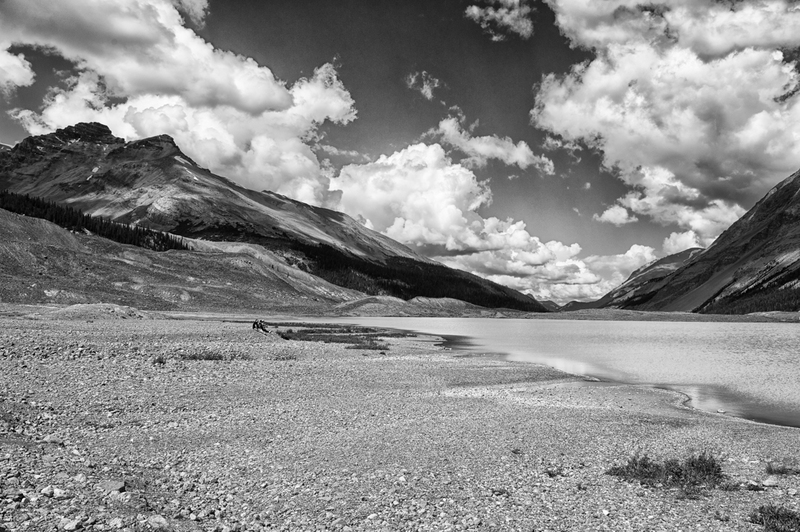 Surprisingly, this photo worked much better in black and white than in colour, despite the fact that the lake is renowned for its colour. Looking across a lake I never could find the name of right at the start of the Icefields Parkway. We came across fields that, only a month before, would have been a brilliant carpet of yellow. Now they were a fine white, almost like they were peppered with fine, fluffy snow. 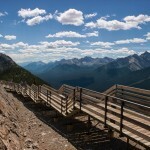 The view south as we climbed up Sunwapta Pass. The drive was completely flat as we wended through valleys; the only climbing we had to do was up a series of switchbacks where we passed over Sunwapta Pass and into Jasper National Park. This was the view from the top; the top photo in this post shows a closeup of the mountains to the left as clouds tumbled over their peaks. It was here that we decided to no longer stop as we were never going to make it to our destination otherwise. 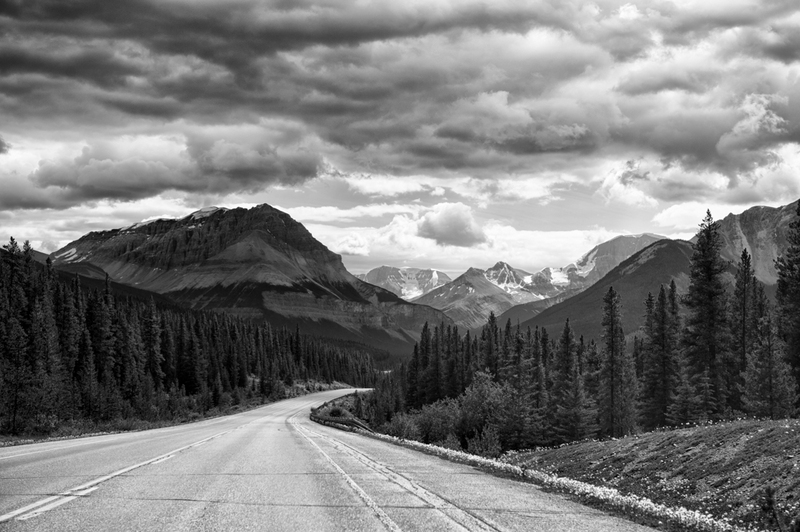 The next day, we got back on the parkway again, headed south towards the Columbia Icefields. This was one of the first views of the icefields as we drove back into them, this time from the north. The weather fined up nicely and we were lucky enough to have a few interesting clouds hanging around, but not so many that it blocked out the sunshine. 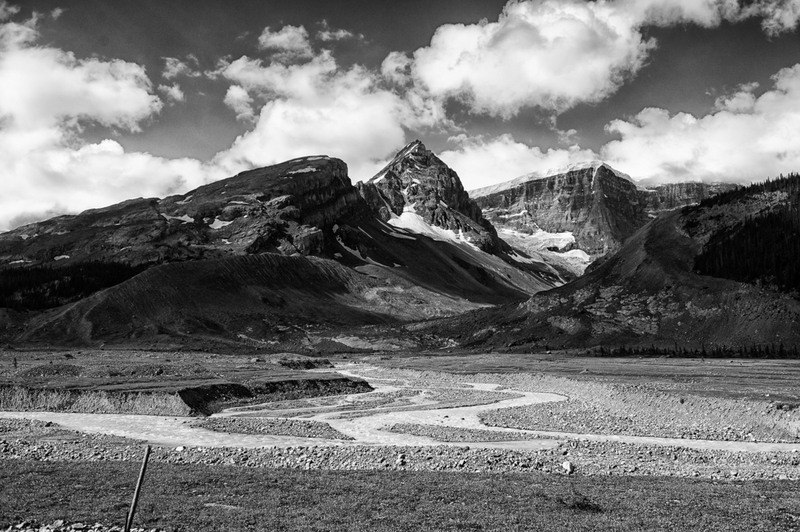 Looking to the west from the Icefields Parkway, just north of the Athabasca Glacier. 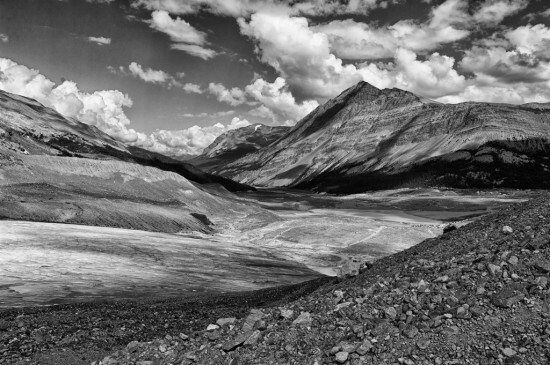 The view from the edge of the moraine on the Athabasca Glacier, looking back towards the Parkway. The almost lunar landscape at the base of the Athabasca Glacier. 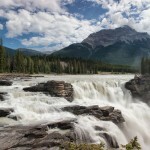 The next day was very much a waterfall day as we stopped to see two large waterfalls — Sunwapta Falls and Athabasca Falls. Both were running very strong as grey glacier-silt-filled water plummeted over the edge. 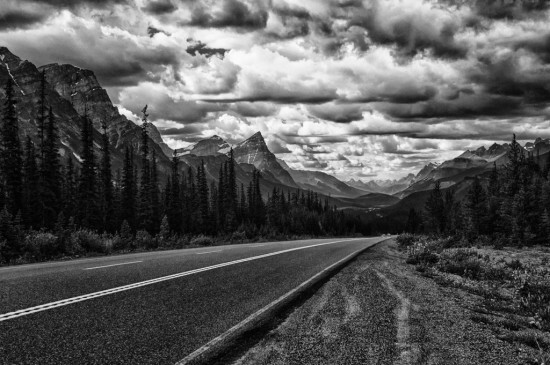 Our final trek down the Icefields Parkway came on another cloudy day that made black & white scenes all the more moody. The mood sort of matched ours, since the last thing we wanted to be doing was heading towards Calgary and our plane flight home. At least the parkway had plenty more in store for us to see — even though we’d already seen everything at least once, it all seemed new again as we saw it from a different angle. 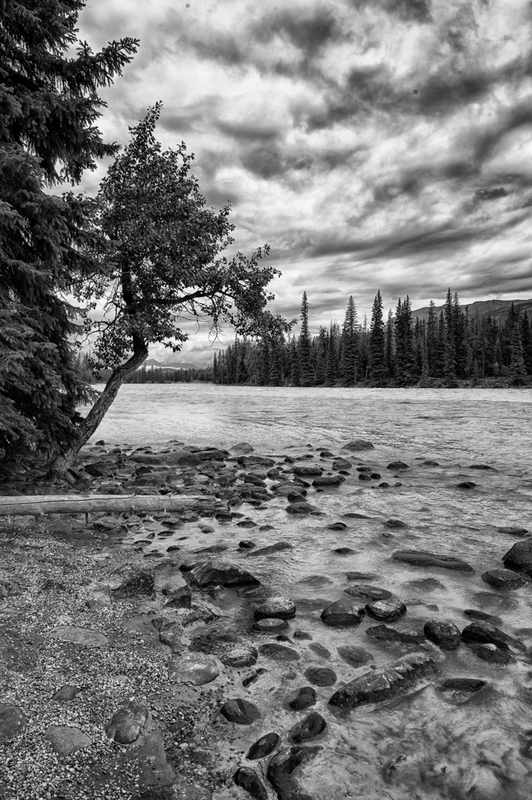 The Athabasca River, north of the falls. 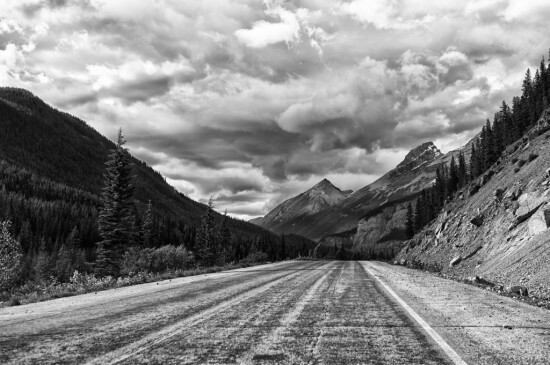 Since we’d already driven the main Highway 93 on the way north, we drove along 93A — which leaves the main Parkway just south of Jasper and rejoins at Athabasca Falls — just to see what it offered. We followed the edge of the Athabasca River for quite some time and had plenty of chances to stop in picnic sites and see views like this one. 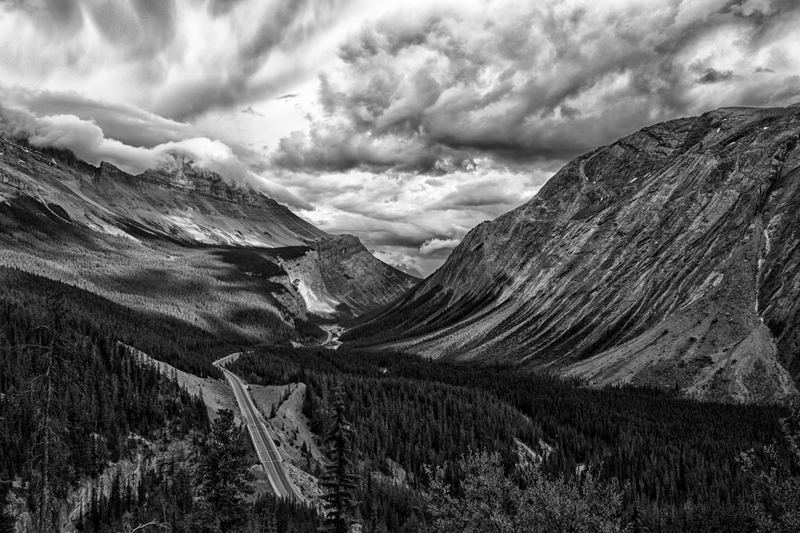 The Endless Chain Ridge in Jasper National Park. 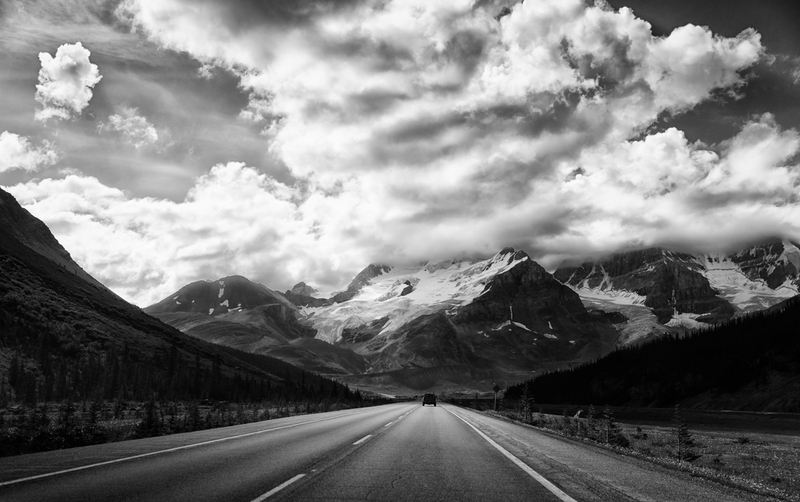 The Endless Chain Ridge really does seem to be endless and is actually one of the longest continuous mountain chains in the world. 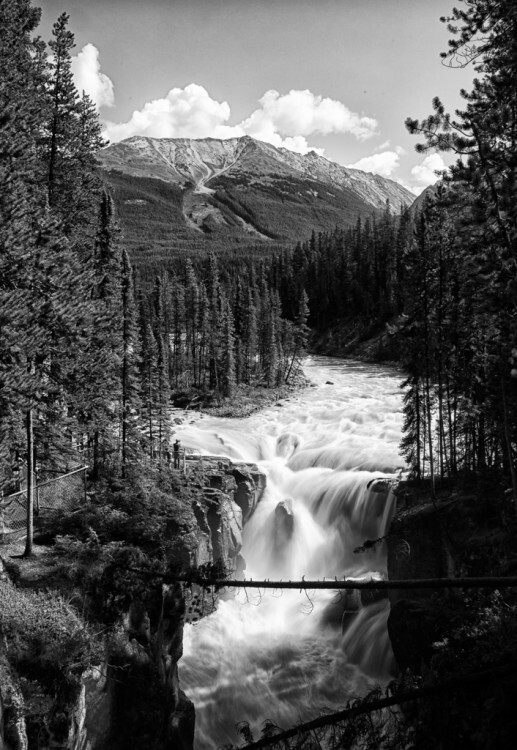 I first paid attention to its perfectly slanted mountainsides from the dining room at Sunwapta Falls Resort when we stayed there, and from the north it looked just as impressive. More gorgeous scenes as we head towards Saskatchewan Crossing. More “on the road again” shots. We saw plenty of heavily-loaded motorcycles traveling all up and down the Parkway. Despite the fact that there’s not a lot of hairpin curves on the road (or maybe because of this?) 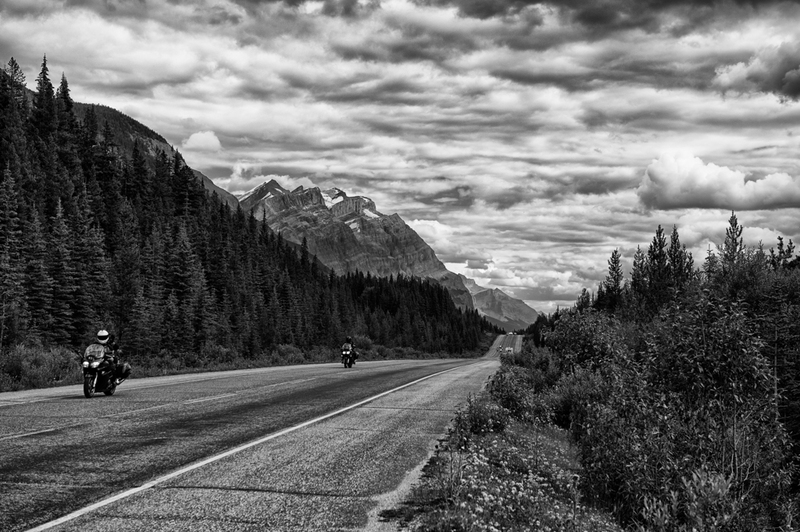 it would still be a fantastic road to go riding on. Peyto Lake, as seen from the Bow Summit. 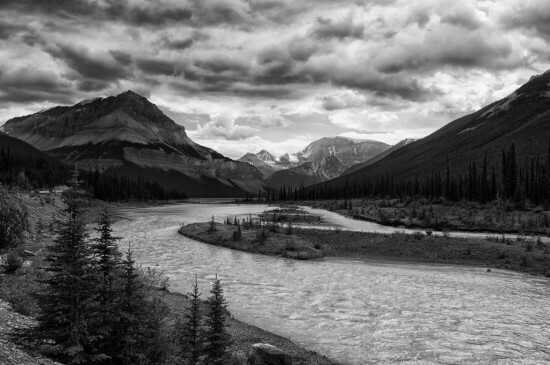 Rivers and lakes — the bread and butter of the parkway. 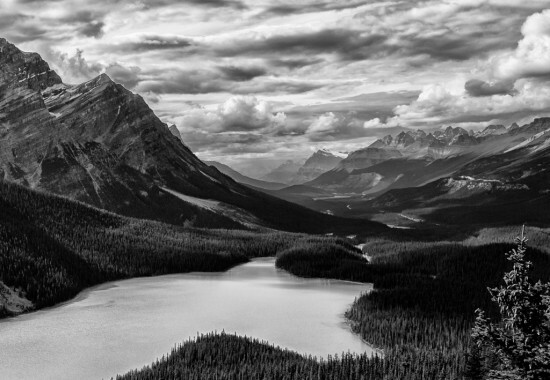 Peyto Lake, in the final photo, is one of the most photographed scenes in Banff National Park, and with good reason. The water was a milky green on the day we visited, its opaque waters shining underneath a sun that stayed out just long enough for us to see the scene in all its glory. 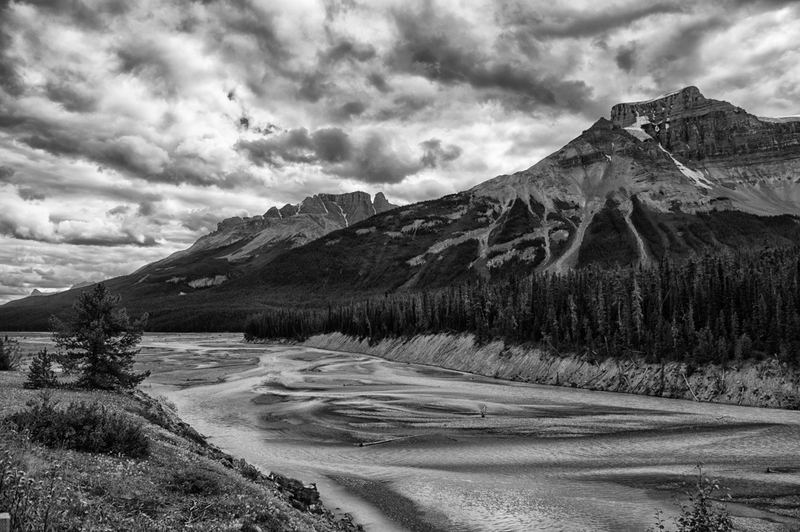 Once again, though, even though the colours in the scene were amazing, I felt like it really popped in black and white, with all the different textures of the mountain ridges, the pine trees, and the water, as well as the interesting, dappled shadows that the clouds cast across the valley. So what do you think — was Ansel Adams right about landscapes being best seen in black and white? Wow. Super impressive my dear. So peaceful and just simply a pleasure to look at. Just sorting out my Canadian visa now. SO pumped after this bog. Hi Prue! Thanks so much for your comment, and I’m so glad you enjoyed checking out these photos! That’s awesome that you’re getting your Canadian visa sorted out. How long are you planning to go for? 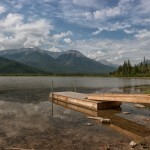 I’d love to go there for at least a year so I could see it in all four seasons. 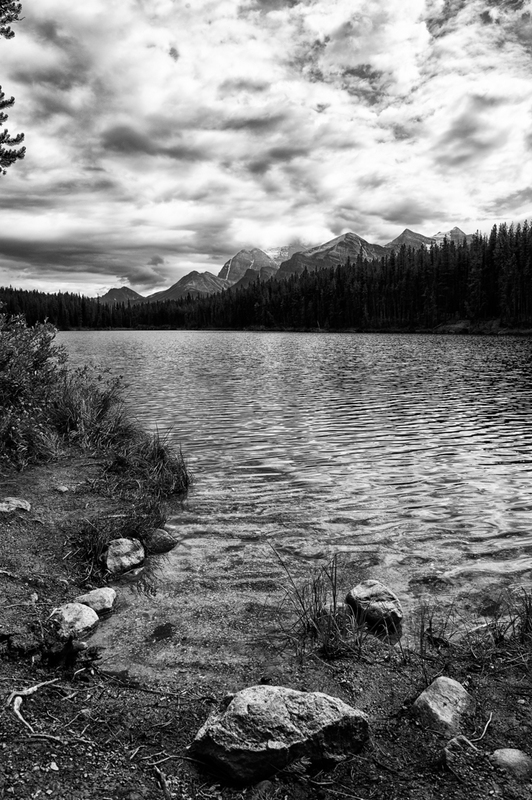 Stunning photography, Kristin! Really impressive work. Thanks very much Raya! 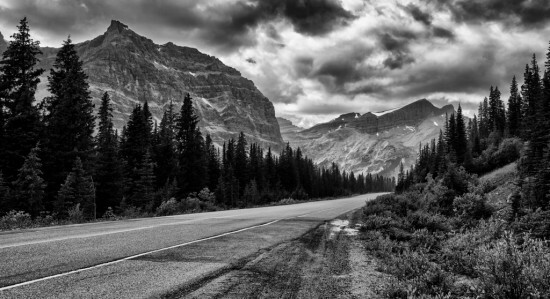 Did you ever get to do your trip to the Rockies?